Our northwoods forests are a beautiful mix of spruce, fir, pine and mixed hardwoods such as aspen and birch, maples, beech and more. The multitude of greens in the summer creates a wonderful palette of colors, especially with the light filtering through the leaves. With luck, you might spot a bear, deer, or maybe even a moose! 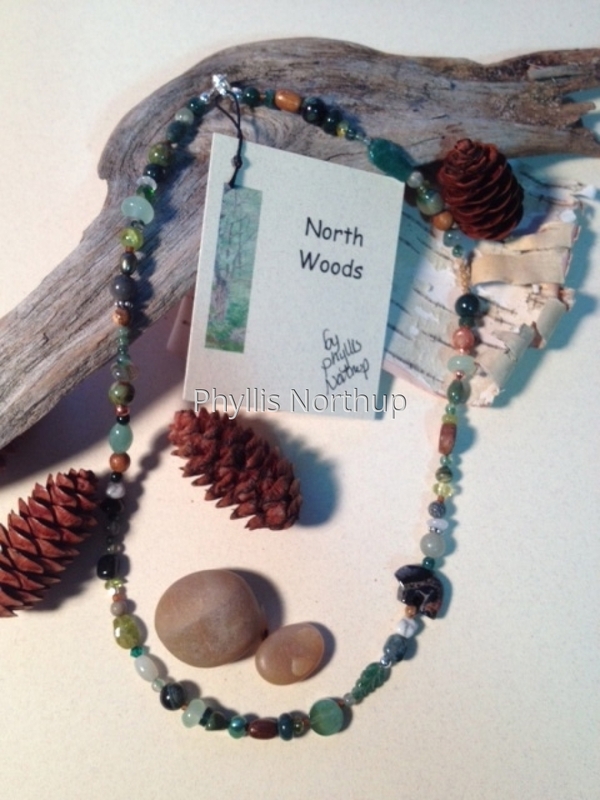 The beads are jaspers, agates, quartz, aquamarine, new jade, rhyolite, & other gemstones Swarovski crystals, glass, wood, with sterling and copper accents. Although similar, each is as delightfully unique as any given patch of forest you might find yourself in! Approximately 16.5" long. Price includes shipping.